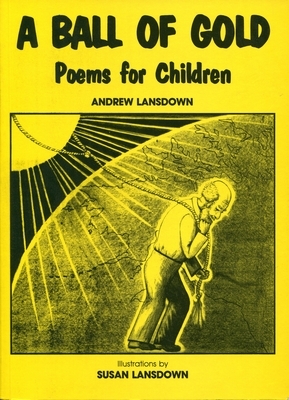 Andrew Lansdown’s poems have appeared in most of Australia’s better literary periodicals and his first book Homecoming appeared in 1979. The sensitive poems in this book were written for his two small children and delicately illustrated by his wife, Susan. says it belongs to him. to bury it for the night. he goes through the earth and past! as he hauls it back across the sky all day. as they flit from a thicket. the blue male, the grey hens. as if they’re playing cricket. with their tails set up as wickets! garden gloves and a shower cap on his scone. whispered mother into her daughter’s ear. at the bottom of the pile. He wants to stay in bed. for Master Fire! Oh no! He wants to stay in bed! A Ball of Gold is a very amusing book of poems, sometimes sad, often funny and all in simple childish verse that is appealing to young children. There are 77 poems in all, with subjects ranging from the story of an African elephant to a Willy Wag’s song. The title is taken from first line of the first poem in the book, “The Sun”: “The sun is a ball of gold, tied to a see-through string”. The poet gives us a good idea of his versatility in these poems. They are about all kinds of animals, people, and things, with, various rhythms and lengths. Some of the longer poems are almost ballads, such as the delightful story of the Blurps’ Party. (A Blurp is a small, round creature that wears fancy clothes in an attempt to make itself known.) The Blurps’ age-old enemies are the Woils, who raid the Blurps’ party. The poems are full of such creatures, that are the perfect basis for a small child’s bedtime story. Some of the very best poems in the book are the several pieces about birds. Seagulls, shags, hens silver-eyes are all included, with their songs, their habits, their food and their feelings. These poems are very informative for children, combining fact with the exciting fantasy of being able to understand the birds’ thoughts. They are accompanied by superb charcoal drawings. Repeatedly the poet shows his talent for personification in poems like ‘Stones’, ‘Master Fire’ and ‘The Wind in the Trees’. The idea of a fire not wanting to come out from a log because he is cold appealed to me, and my young friend liked the way the stones fell to the riverbed and felt the water tickling their heads. A good point about A Ball of Gold is that all the poems are about things that small children can relate to, such as nature and incidents in their own, everyday lives. The book is illustrated by the poet’s wife in soft greys and delicate line drawings. Susan Lansdown has also drawn some cartoon figures, and portraits of the Blurps and Woils. Some of the poems are printed so that the words themselves form pictures.